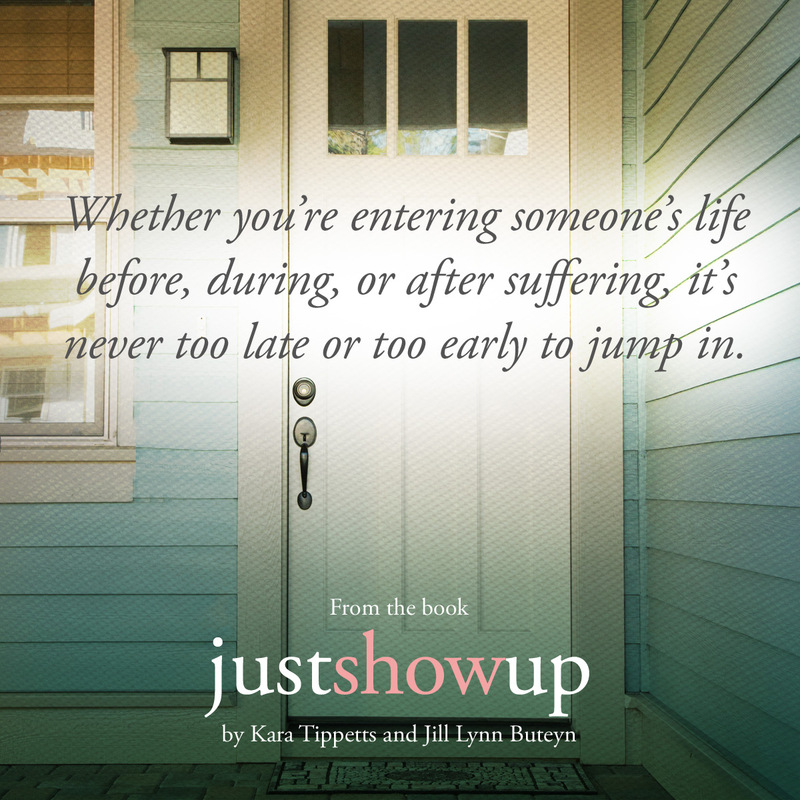 Kara and Jill's book, Just Show Up, released this month! In this book, they share about the community that surrounded the Tippetts family when Kara was battling cancer, and they help the reader learn how to walk through suffering with a friend. 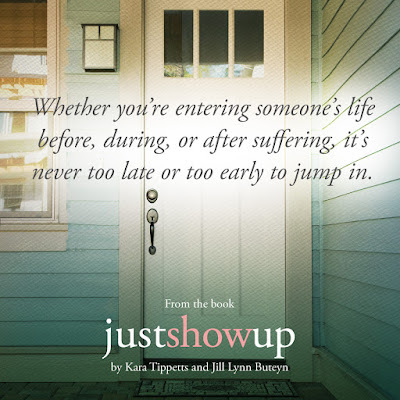 I had the opportunity to read and review Just Show Up this summer, and it is definitely a book that I recommend. Today the Mundane Faithfulness community is gathering to share stories of how people have shown up for us in our hard times. Earlier this week I shared how my family and friends from Georgia showed up for me this summer. Today I would like to share how a few friends, both local and far away, have shown up for me in recent months. 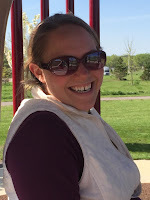 One of the first people to reach out to me when my family moved to Minnesota in 2012 was MaryAnne. She just stepped right into my life, not afraid at all to befriend someone with a serious chronic illness. I will be the first one to admit that it is not easy to be friends with someone like me. Those who want to be my friend have to sacrifice of themselves. I can rarely visit friends in their homes; I need them to come to me. If they are sick, I am not able to take care of their children for them, but there are days when I need them to take care of my children for me. It can be awkward to have a friendship that is so unbalanced like that (something that Kara and Jill talk about in their book), but MaryAnne makes the awkwardness easy. She doesn't mind when I have to cancel our visits. She is flexible when I need to change my schedule. She often offers help. As my physical needs have increased in recent months, her offers of help have also increased. When MaryAnne found out that I was struggling this summer, she offered to watch William and Adelaide on Wednesday mornings so that I could have a break in the middle of the week. It was so helpful to have a morning where I could sleep in a quiet house and catch up on much needed rest. William and Adelaide loved the days when they got to play with MaryAnne and her daughter, Cecilia. MaryAnne would often take them places like the library, a park, or the bakery. 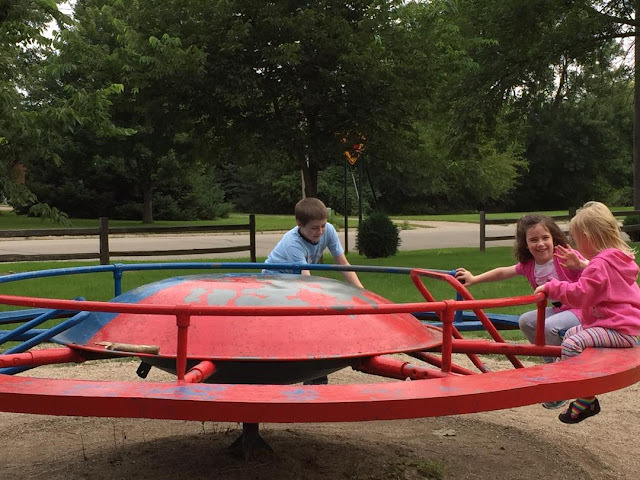 It was such a blessing to have someone take my children out for adventures around town. William and Adelaide also enjoyed the mornings when they simply played at MaryAnne's house. There were new toys and games that were fun. 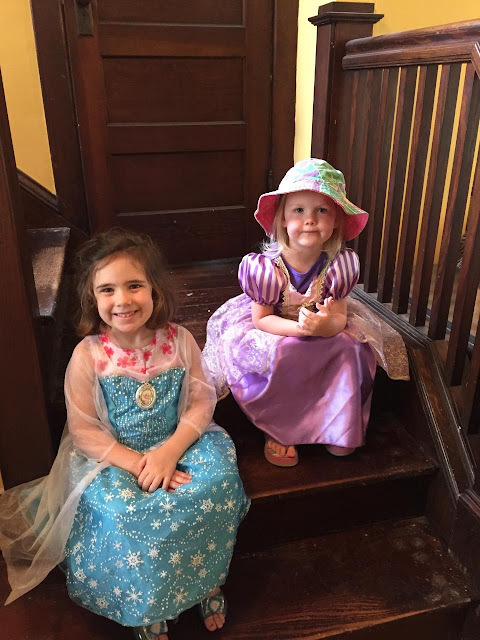 Adelaide particularly enjoyed playing dress up with Cecilia! I'm so grateful for MaryAnne helping us make it through the summer. Life is a little bit easier now that William and Adelaide are in school during the day, but days are still long and hard. MaryAnne has continued to offer help in various ways. What a blessing to have a friend who shows up in the hard days. In the past month I have also been blessed by friends from far away who showed up through the mail. Several friends and family members have sent cards, and a couple of friends have sent packages. Mail is always fun, but the more homebound and isolated I become, the more I appreciate mail. When I am too exhausted to have a visitor, or when a friend lives too far away, receiving mail is like a giant hug! It is a reminder that I am seen and not forgotten. My friend, Elizabeth, (who I mentioned on Tuesday), sent a package filled with fun purple things last month. There were fun items, practical items, and a beautiful scarf. There were even a few items for Will, William, and Adelaide. My favorite item was this little notebook. Elizabeth filled this notebook with Scripture verses. On each page she also wrote "KOKO," which means "keep on keeping on." The notebook has 49 verses total. I am going through this notebook and reading one verse a day. After I finish reading it, I will keep it next to my bed for the especially tired and weak days. This little notebook is small and lightweight, which means I can pick it up to read on a day when my Bible is too big and heavy for me. It will also make it easier to read a Bible verse on the days when I struggle to read because of brain fog. I have been so blessed by Elizabeth's friendship in recent months. Not only did she come to help this summer, but she has been faithful to encourage me since then. She texts me almost every day! Sometimes it is a simple text saying, "KOKO." Other times she shares a picture or a verse or something that encouraged her. She shows up from far away and encourages me in my daily life. When I saw this written on the outside of a package, I knew I was in for a treat. The Phillips family, dear friends from Virginia, knew that I was struggling this summer, and they sent this package to encourage me. 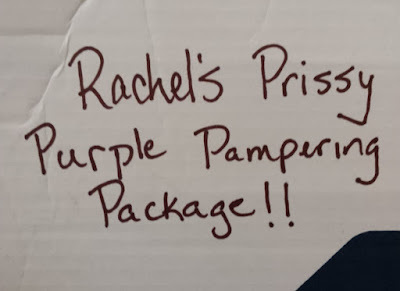 I don't think I have ever received a pampering package before, so this was absolutely delightful. 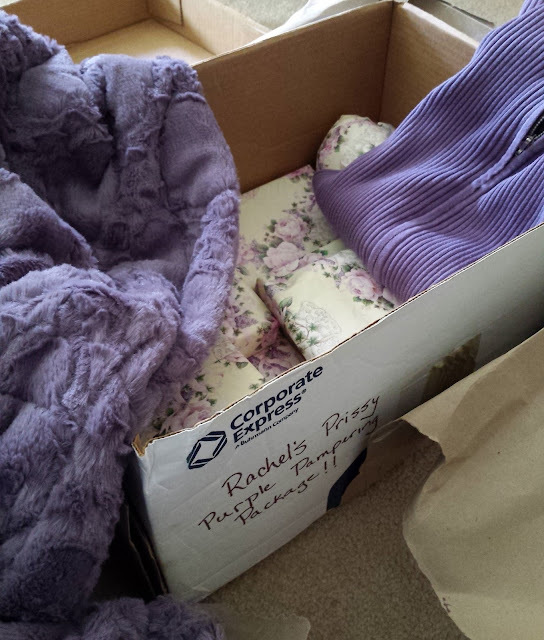 I opened the box to find a lovely purple sweater and the most amazing purple throw blanket. I had actually been needing a new throw blanket, and this one will be so soft and cozy this winter. I began opening the little presents one by one. There were sentimental items, practical items, and items for pampering and comfort. I made it about a third of the way through the package before I had to stop and get tissues to wipe the tears away. When a package like this comes on a very hard day, it is overwhelming! Do you see that little kitchen soap dish with grapes and a ladybug on it? That was in the Phillip's home when I used to babysit their children years ago. Oh the memories! The hand cream, soap, and bath gel infused loofah smell so wonderful. The eye mask is perfect for resting in my recliner. The purple neck wrap is filled with lavender, and has already been so helpful in easing muscle aches. Oh, I have been pampered and loved well! Thank you, friends, near and far, who love me in my hard days and show up with help and encouragement. You make life a little easier, and you bring joy to my days. Who do you know who is suffering and in need of a friend? I encourage you to reach out to her. Show up in the midst of her pain. Whether you are near or far away, you can help in practical and tangible ways. Your encouragement may be just the help she needs to continue to persevere. It is not late or too early to just show up. 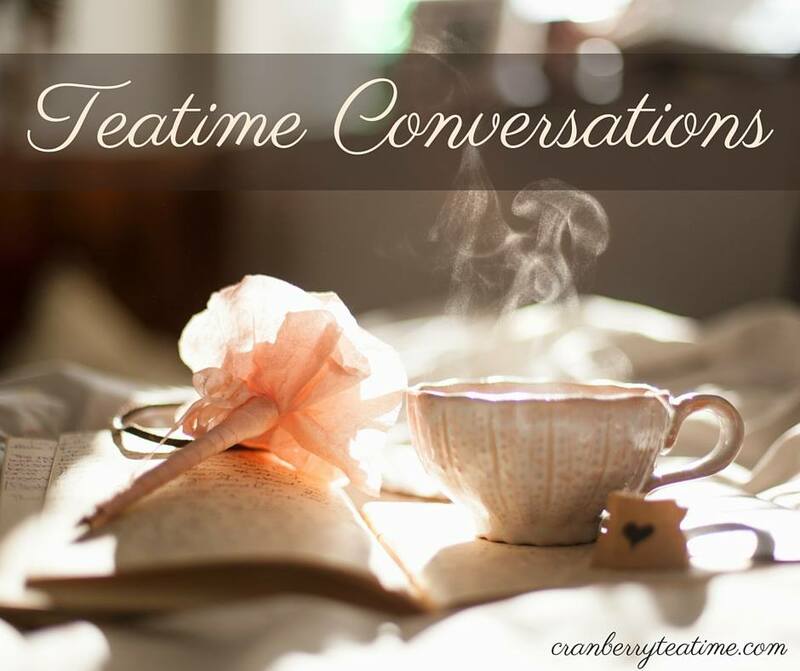 You can find many more Just Show Up blog posts in the link up at Mundane Faithfulness today. 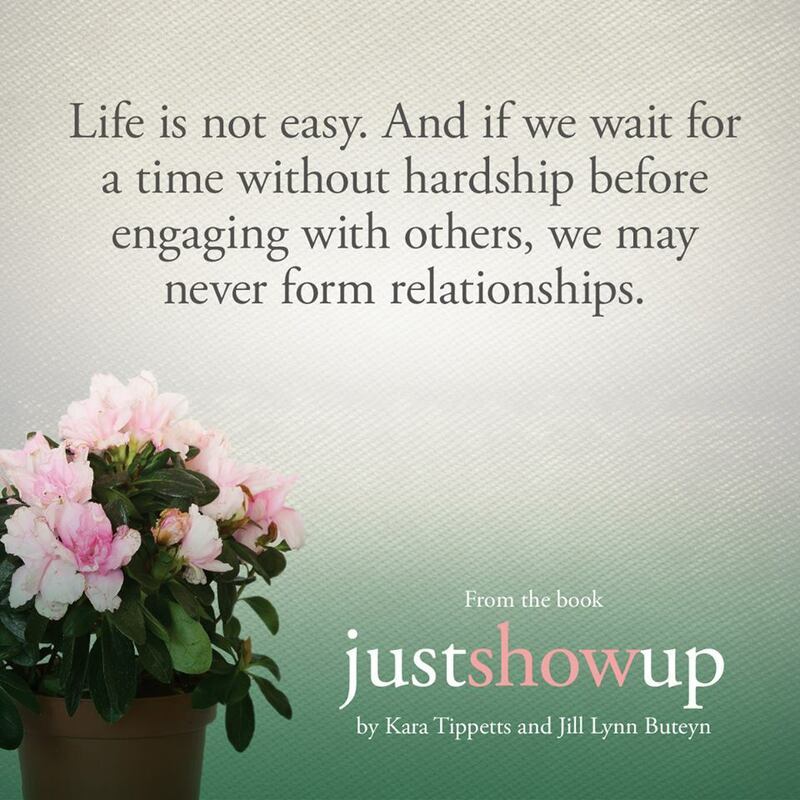 These are stories that will give ideas for how you can show up for your friend.